OutSource Topics: Testers, Mktg, Support, Strategist, Development, Content, Data Analysts, Pitchers (not Baseball), Dealers, Security, Admin, Book-keeping, Tax, Legal, Project Mgt, Design, International, Service, HR. Limited Time & Resources is what most people of Startups & Small Business have. [they’re Lean] Recognizing this is the key factor on how they manage their business. They have to get the most out of these assets. If the founders are technology experts, they should spend most of their time doing technology tasks – not Marketing, Admin, Accounting, etc. These tasks that will take them twice as long and probably have half of an expert’s effectiveness. It’s a waste of resources. Rather than make fixed commitments through full-time hiring, you can OutSource non-core tasks and hire the true “expert” at a reasonable rate or small equity share. Which is why outsourcing is so important to your success. What to OutSource is what the Founders/ Management should consider? Which tasks should take priority? Here’s a list of common OutSourced functions and why they work well for Startups & Small Business. Review each function as you grow & develop, for what you need now & in the future. 1 — Product Testers. Whenever you create a product, you want independent Testers to come in and “validate” the design. They need to find bugs, flaws, and other diminishers of the user experience or technology functionality. Getting reliable testing is extremely important to avoid customers finding these items after you launch. OutSource it and continue to work with the good Testers as you continue launching new products & updates. 2 — Sales/Marketing. Most Startup & Small Business owners know little or nothing about marketing their product or service. You need expertise. This is one of the most important function to OutSource – so due your diligence. Ask for performance factors & check them out with a few of their Clients. Ask them to draft a basic plan – so you see what their approach is. If they’re good + confident, they’ll work primarily on commission. 4 — Strategy Advisor. This one is seldom used by startups. Since many businesses are started by technology-focused founders, they can use a bit of business sophistication. If you don’t have a Mentor, some independent feedback from this Advisor can be valuable to assess your market, customers, product specs, pricing & more. 5 — Specialized Development. Even if you’re a tech firm, finding some good freelance development specialists can help immensely. And if you’re not a tech company, don’t give up your valuable equity too easily. Simple jobs like creating a Website or Mobile App are not that difficult. 6 — Content Creators. Whether you’re looking for marketing materials, audio, video, photography or written articles (ie, public relations, explaining your technology, etc) and even other forms of content to enhance your Brand – choose the expert you need. 7 — Data Analysts. You would be surprised how much you can learn from the correct data. A good Data analyst can help you determine what data will help you make better decisions, where you can find it, how to capture it, and then set up the technology to analyze it to find out what it means. 8 — Pitch Creators. When you’re creating your Investor Pitch, you really ought to hire an expert to do it well. An Investor can definitely tell the difference between expert presenters & amateurs. An expert will help you sell your idea better, because they know what an Investor is looking for. 9 — Deal Specialists help by putting together your Investor Pitch. Then they’ll look for Investors – to help you raise the money you need to grow. As your Startup matures, they may look for you to partner up, make acquisitions, do joint ventures with other firms, or make other strategic deals. 10 — Cyber-Security. The last thing you need is to sink your business because of security vulnerabilities. Get the right help to protect your code, network, customer information, financial data, & other proprietary information. 11 — Virtual Assistant [VA] for Administration. You can hire a low-cost but good Admin from the Retirement Pool or Overseas for at or < of your home country’s minimum wage. They will work on your schedule, speak good English, and work as much or as little as you need them. Here are the typical, routine tasks they can handle: Data Entry, Scheduling Appointments, Booking Travel, Filing, simple Research, Responding to frequently asked questions [FAQ]. 12 — Accounting/Book-keeping. (or Bookies) In initial stages, there probably isn’t much book-keeping work to be done. But as you grow, you should OutSource book-keeping, so you know how your Cash Flow doth go. 13 — Tax Accounting. A lot of startups choose Silicon Valley and other high Tax jurisdictions, which isn’t always optimal as you become profitable. Getting an initial Tax consultation can help you make good strategic Tax decisions. And then you can retain Tax specialists to track your obligations and minimize what you owe. 14 — Legal Aid. Retaining good Legal counsel is important to any business. Don’t wait until you have legal issues to get the right guidance. You don’t need expensive firms. Instead, find some freelance Legal talent to help with you company’s legal form, contracts, customer terms, employment law, investor terms, etc. Getting this right in your growth stage can save you big in the long run. 15 — Project Management. (SmBiz) As you grow and start launching bigger initiatives, you might need some Project Management. PM’s can help you stay organized around big technology implementations, market expansions, product releases, etc. 16 — Design & Development. (SmBiz) When you get bigger, you might hire a full-time Designer. As you grow, it will become more & more important to differentiate your product with improvements & innovation. 17— International Business Consultant. (SmBiz) There is so much benefit in expanding overseas. Whether you’re adding international Reps (or partners), entering new markets or even doing some Outsourcing, this is highly likely to benefit you by helping you grow. 18 — Customer Service. (SmBiz) Beyond simple Customer Support, as you start to build a good customer base and can’t handle it, you’ll need good people that are solely dedicated to your Customer. If you don’t need a full-timer, there are firms that handle it based on whatever volume comes in the door. That keeps you focused on developing your product and growing your company. 19 — Industry-Specific Specialists. (SmBiz) Don’t be afraid to locate the best experts in your field. You don’t know everything in this Industry and don’t have time to learn. Bring in the people that do. This will vary by industry, but is important to on-going growth. This might include business intelligence, researchers, function specialists and more. 20 — Human Resources. No (SmBiz) will ever flourish, if they fail to take decisive steps to prepare for growth. Poor management and a lack of access to resources are among the primary causes of a startup’s failure. By outsourcing your HR function, you are looking to ensure your business enjoys access to a steady stream of talent while tailoring the firm’s compensation and benefits packages to encourage employee engagement & retention. Comments: Do you know any other Functions that would be good to OutSource? 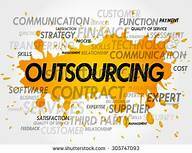 For more Info, click on OutSource.